Donating blood is important. It can save lives! In an effort to get blood from healthy, younger members of society, the Japanese Red Cross has a not-so-secret weapon: Anime characters. For the past few years, anime characters or anime-like characters have appeared in blood donation posters. The Japanese Red Cross also has a cute mascot character. Mascot characters are incredibly common in Japan, so this isn’t that unusual. The use of anime characters for blood drives, however, is interesting enough that even Japanese net users have recently been pointing out this connection. Sometimes, as you can see below in a photo from website Yurukoi, donating blood means you can get a limited edition present like a Naruto notebook. This poster is for the Red Cross center in Tokyo geek haven Akihabara, which Kotaku previously introduced. The Red Cross also shows up at events like Comic Market for blood donation drives. I think this is very cool! And it’s great to see young people giving blood. 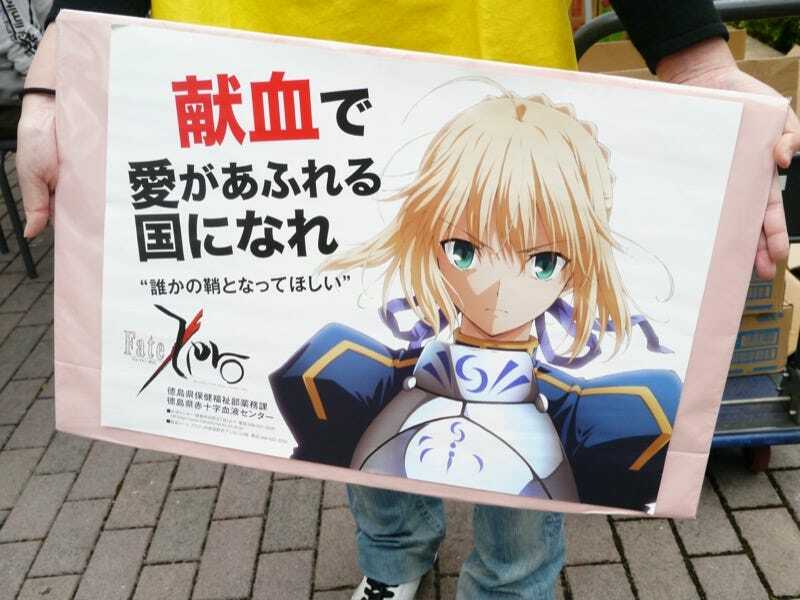 Japanese site Gigazine previously covered at blood drive at one of these anime events.